Ground based marks accurately placed on the meridian were regularly used by the Greenwich astronomers as a quick means of determining the alignment errors of their transit instruments. Ideally, both a northern and a southern mark were used. John Pond, the sixth Astronomer Royal, gives a description of the marks at Blackwall in the annual volumes of Greenwich Observations. The extract below is from the volume for the year 1834. The position in azimuth was ascertained, when the atmosphere permitted, by observing the north meridian mark at Blackwall, which was set up in July 1816, on the wall of an engine-house at the East India Docks, at the distance of 10,706 feet from the Observatory; but the engine-house being taken down about September 1833 [about the 25th], a temporary mark was painted on the iron facing of the wharf of the said docks. Since which period, a larger building, designed for a tavern, has been erected on the spot where the engine-house stood, about forty feet high, and which affords a great advantage for a new mark, the original one being only about fifteen feet high. A new mark on February 27 last , was fixed on the blocking course [the plain stone course projecting above the top cornice] of the building: it consists of a thin iron plate, 19½ inches high and 12 inches broad; the middle is painted white, 5 inches broad, with a 3½-inch black border: it is secured to the blocking stone by four screws, the plate having grooves or slits to admit of a small adjustment. The distance of the meridian mark from the transit instrument has been computed, from MUDGE’S Trigonometrical Survey, to be 10,706 feet … The position of the original mark was verified by numerous observations of Circumpolar Stars above and below the Pole; but unfortunately it was often rendered invisible for a week or fortnight, and occasionally for a longer period, either by ships moored near the place in the direct line of vision, or by vapours arising form the River Thames, and the London smoke, especially during westerly winds. In the spring of 1824 a second North mark was erected at Chingford on the Essex hills, at the distance of nearly 11 miles, and made to coincide with that at Blackwall, which was again verified by numerous observations of Circumpolar stars. The engine-house Pond refers to is something of an unknown quantity as there are no known images of it. The East India docks were developed from Brunswick Dock (also known as the Brunswick Basin and sometimes as Perry’s Dock) between 1803 and 1806. A period of development immediately followed, with buildings being added and replaced. The engine-house does not appear on contemporary maps or plans. Nor is it mentioned in the relevant volumes of the survey of London published in 1994. It is not shown in the view of the docks published by William Daniel in 1808, suggesting, either that it was built after that date or that he presented a sanitised view. It was undoubtedly present when the Thames was surveyed by Captain F Bullock and Lieut E Burstal between 1830 and 1833. It was this survey that was used as the basis of the 1859, 1865, 1871 and 1898 editions of British Admiralty Chart No. 2484. Although some aspects were updated with each new edition, none show the Brunswick Hotel. All four show the position of a small building in the correct location for the engine-house. The 1809 image set contains a print republished in 1814. 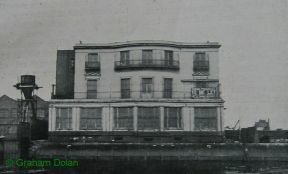 The tall building is the Mast House, which stood at the western end of the Export Dock. The engine-house, were it there, would appear somewhere behind the smaller of the two sailing vessels moored in front of the Mast House. The tavern Pond refers to is the Brunswick Hotel or Tavern. Demolished in 1930, there is a picture of it in both the 1929 and 1930 image sets. Its footprint can be seen (ringed) in the later 1940s aerial view. There are no known images in which the mark can be seen. In 1953, G.E.W. Gosnell recorded that two signs, were put up on the banks of the River Thames to mark the position of the Meridian for the benefit of passengers on the River. Although photographic evidence exists for the mark on the south bank, none has been discovered for the marking that was here.